This is real interesting.. when you keep encountering a number again and again in life, you tend to associate yourself with it. That number becomes “your” “lucky number”. So lets start.. first encounter.. the most amazing one.. 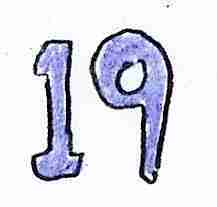 I was born on 19th August So 19 will be eternally associated with me in this way..
And now I start with the time when I actually started noticing it in the present. DOB can be noticed at any point in time so its not that special..
Everyone has this day in his/her life : The day when one makes his/her first email id. And while some are really lucky to get the id matching their name, some are not. My name isnt that unique, and I was in no way one of the first ones to make an email id, so I fall into the latter category. I tried some arbitrary number(dont remember now) with my name when I was asked for another email id(say pawanjainXX). That was sify(was very popular those days, around 1998). I press enter, and then it says that pawanjainXX is not available, and then gives some options which include pawanjain19. And Aha! I chose pawanjain19 in no time and thats how my net presence became pawanjain19! Hmmm.. there are more worth mentioning. My roll number in IIT Delhi. Well everyone gets a roll number in a college. Mine is 2003CS10177. Nothing great. But we get a login id for our network accounts too. Thats cs1030177. I dint notice(probably you have already). But a very good friend of mine, after listening to my “19 story” (not many of my frnds know this story, which is one of the motives of writing this blog), that the numbers in my login id sum up to 19. Now that was interesting to me, because this triggered me into believing that, maybe I might be having 19 in many more things that go unnoticed to me. After this I try to find 19 in almost everything that happens with me. my “lucky” number happens to be 9.. I encounter it everywhere.. Right from my bank account number to my board exam roll number many things in my life somehow turns up as 9..! Copyright ©2008 nineteen till i die. All rights reserved.